Have you considered adding a porch to the back of your home? If so, have you started to consider where they would go in relation to the back of your home? There are many factors that determine where your outdoor living area should be in relation to your house and those factors are different for every house. Those factors include everything from the location of windows on the back of the home to the direction the home faces and many factors in between. The deck that adjoins to the screened porch accommodates a grill to be placed outside of the porch for easy access. If you plan on doing a bit of dining on your screened porch, then the proximity of the porch to your kitchen will be an important consideration. When you know you will have your hands full with items being transported from the kitchen, it’s ideal if the porch is in close proximity to your kitchen. Our customers often ask us about the best place to put a screened porch and there is another reason that having it near the kitchen is a good idea. The most used room in modern houses is the kitchen when it comes to entertainment purposes. So, adjoining the porch to the kitchen will give the room more dining and entertainment value. The elevated porch you see here is attached to a new deck made of AZEK’s Morado color. This color is a light-to-medium brown and is very popular right now. AZEK is a cellular PVC decking board that’s one of the lowest maintenance boards on the market and carries one of the longest warranties. 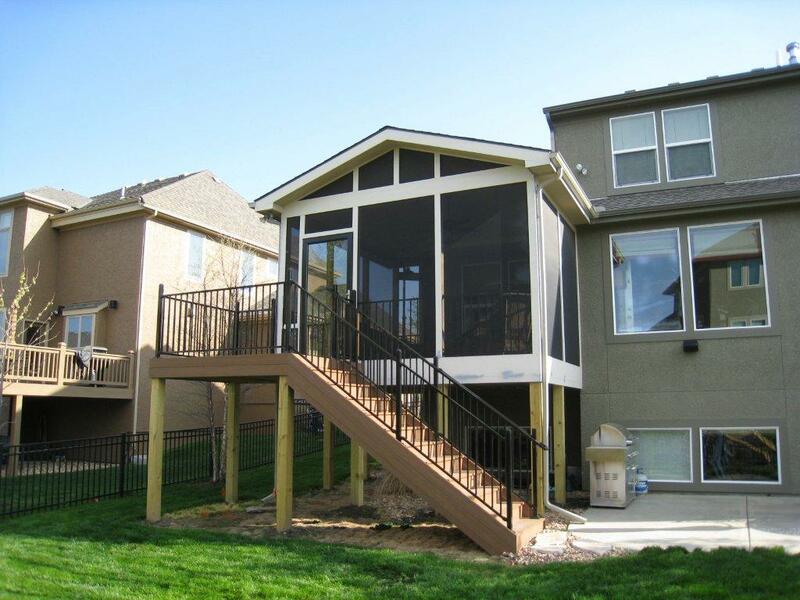 This elevated gable roof screen porch in Overland Park KS has an adjoining AZEK deck with Fortress steel railing. The deck includes Fortress steel railing. The steps are also made of AZEK Morado with the Fortress iron railing. The steps are designed to connect down to the concrete patio. The enclosed screened porch has an open gable style roof. The open gable allows for more light and air circulation. The roof has a custom roof connection into the side wall. If you are considering adding a porch, deck, patio or other outdoor living structure to your home, give us a ring for a free consultation. We look forward to hearing from you. We can be reached at (913) 851 – 3325 or via email at kansascity@archadeck.net. 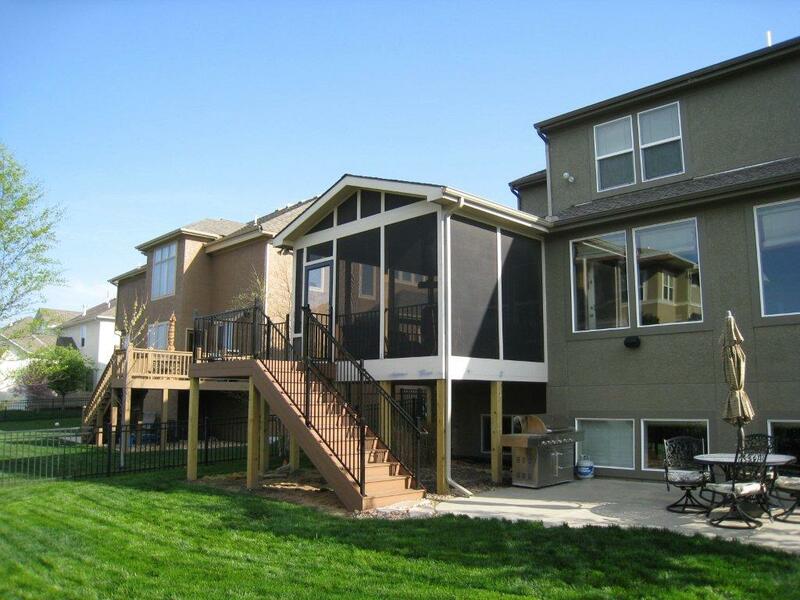 Please take a look at more screened porch pictures and synthetic deck pictures on our website. This entry was posted in Overland Park, Screen Porches, Screened porch, Where we build and tagged Archadeck of Kansas City, AZEK deck Overland Park, AZEK Morado stairs Overland Park, Elevated porch Overland Park, Foretress railing Overland park, Overland Park KS screened porch, Porch Overland Park, Screened porch Overland Park on May 29, 2012 by archadeckkansascity.